I am not sure how I missed this Lifehacker article a couple of months ago (PCWorld shared it first, a few days earlier), but they provide an excellent short tutorial for finding “free” Kindle Lending Library books from the web browser. I have been racking my brain for a good year trying to figure out an easy way to find Lending Library books on Amazon’s website (I do my Kindle book shopping on a computer since Apple quit allowing in-app Kindle purchases). There are curated lists of Lendable books on GoodReads, but they grow stagnant since it requires manual updates. The aforementioned solution is dynamic, so it gets automatically updated as Amazon updates available titles. Bookmark the direct Lending Library link here. If you aren’t familiar with the Kindle Lending Library, it is a “free” service that Amazon started providing to its Prime members ($79 per year) in November 2011 allowing them to borrow a Kindle book from Amazon instead of having to purchase it. Prime members may borrow one book at a time, with no due dates, but can only borrow one book per month… if you read fast, you’re stuck waiting until the next month to borrow another book. Not all Kindle books are available through the Lending Library. And (here’s the part that frustrates me), the Kindle Lending Library ONLY works on actual Kindle device — not Kindle apps. This means you can’t borrow books to read on your smartphone, tablet, or computer (I have to snag my husband’s Kindle Fire to read Lendable books). Hence the official name “Amazon Kindle Owners’ Lending Library”. NOTE: I don’t subscribe to Prime simply for the Lending Library; there aren’t enough titles of interest to me and I primarily read on my iPad, but we use Prime heavily at home for shipping (especially at Christmas) and for watching “free” movies on Amazon Instant Video. Amazon makes it much easier and faster to identify Lendable titles from within an actual Kindle, providing how-to instructions and screenshots for each Kindle device. Now with this tip from Lifehacker and PCWorld, it’s just as easy for those of us browsing on a computer. I have been compiling a web guide for the Southern California chapter of the Evangelical Church Library Association on where to find Christian ebooks (free, subscription, or for purchase), so filtering that direct URL on Amazon’s “Christian Books & Bibles” category gives me a dynamic list of just their Lendable Christian Kindle books. 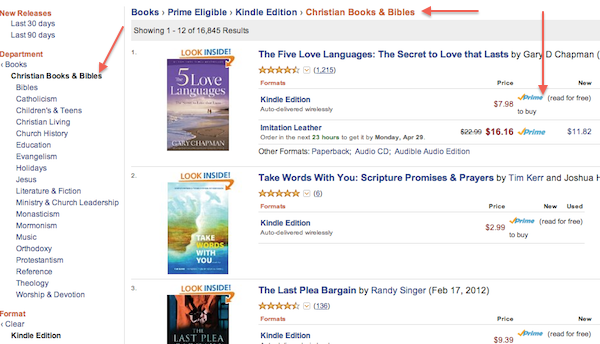 Filtering on just those Kindle Lendable books in the “Christian Books & Bibles” category. Thanks for sharing this information. I am an Amazon prime member but learn about the system just from your post.